A chemical reaction occurs when two substances are mixed together to make something new. Sometimes chemical reactions can have an exciting end. Middle school students like to perform experiments. You can do some chemical reaction experiments in the classroom, with goggles and teacher supervision. However, there are also many chemical reaction experiments students can enjoy doing on their own, whether in school or at home. 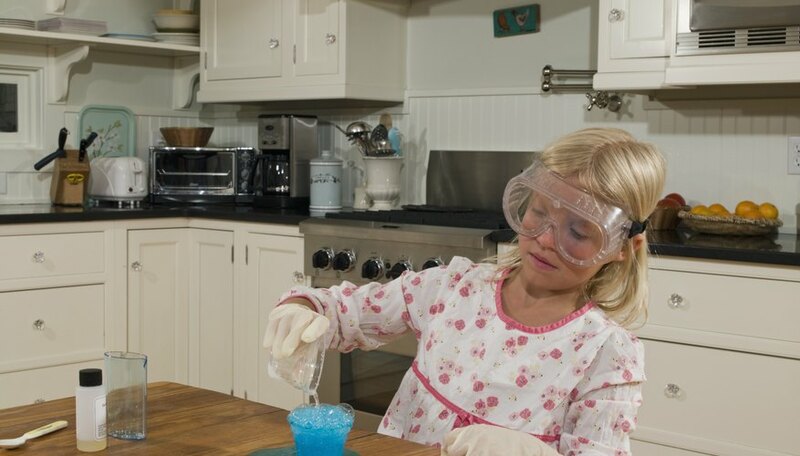 Baking soda is a common, inexpensive household substance that is harmless for kids to use in experiments. Baking soda will react when acids are added to it. Middle school kids can test whether liquids are acids or bases by adding a teaspoon of baking soda. A few of the liquids you can allow them to test are orange juice, vinegar, lemon juice, water, vanilla and soda. When adding acids to the baking soda, the mixture will bubble up because of the chemical reaction. Create an eruption using soda and candy. The best products to use with this chemical reaction experiment are Coke and Mentos. This is definitely a project for the outdoors, so you have less mess to clean up. Have most of the students stand back, but have one student ready to drop the entire pack of candy into the soda. Drop the candies in as quickly as possible and get back. Carbonation is essentially bubbles of gas. When you drop the candies in the carbonation, it eats away at the surface of the sugary candy. This causes more bubbles to form, and soon they do not have anywhere to go but up, causing a soda fountain. Have your students test different substances to see which will form the chemical reaction of rusting. Rusting happens when metal objects receive no protection from the elements. Have a series of nails to use as the object. Set one nail aside for the control. Put other nails in different liquids to see if they expedite rusting. Water, soda and vinegar can all be liquids you use. Be sure to put the liquid along with the nails in close containers. Leave them for a week or so and remove them. See if any of them show more rust than another. Make your very own fire extinguisher using baking soda and vinegar. Make sure to have an adult help you with this experiment. Light a candle and set it aside. Into a glass, put one teaspoon of the baking soda and cover it with about an inch of vinegar. The bubbles you see forming are a chemical reaction forming carbon dioxide. Use a toilet paper tube to pour the carbon dioxide gas down to the candle. Do not pour the liquid; just allow the gas to slowly make its way down the tube to extinguish the candle. The carbon dioxide is heavier than the air, which is why it will slide down the tube. It then pushes its way through, robbing the candle of the oxygen it needs to burn. O'Neil, Ruth. "Chemical Reaction Experiments for Middle School Students." Sciencing, https://sciencing.com/chemical-reaction-experiments-middle-school-students-10039222.html. 25 April 2017.